Party & Evening Wear There are 29 products. Elegant and beautifully tailored cotton lace, round neck long jacket in cream/ivory with 3/4 sleeves. Fastenes at the front with gold metal poppers. Stunning maxi dress with a twisted back and embellished waist band.The ultimate maxi dress as you can dress it up or down. Made in soft jersey, fully lined with contrasting tulle for that added luxury. 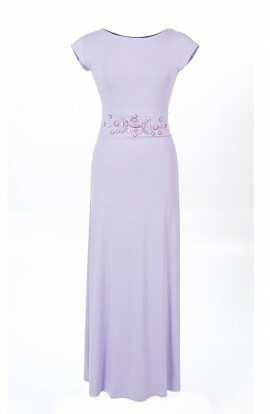 Wide waist band embellished with semi precious stones.It measures 165cms from shoulder to hem and machine washable. Sequined mini dress with 3/4 sleeves and lower back for a sophisticated look. Cleverly cut sequin panels are great for slimming. Perfect Little White (slightly off white, almost cream) Dress for a party or going out. Model is UK size 10 and 5 ft 9 wearing a size Small Made in England to the highest quality.